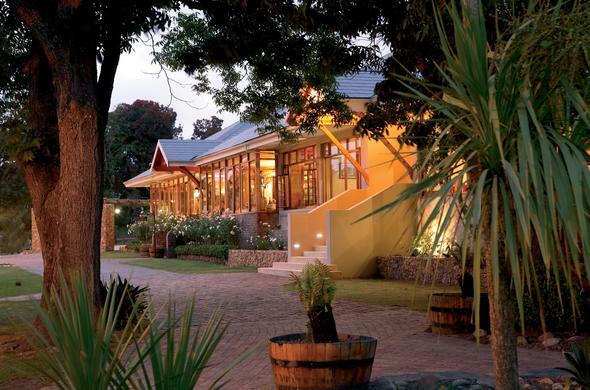 Knysna Hollow Country Estate, located just outside the charming town of Knysna in the heart of the Garden Route, offers comfortable accommodation in a tranquil setting. Knysna Hollow Country Estate is beautifully set on a secluded old country estate near the famous lagoon of Knysna. Set amongst timeless oaks and pecan trees, the gracious old manor house forms the focal point of the lodge. Built in a bygone era, it is finished with pressed ceilings, yellowwood floors and authentic furniture. Enjoy pre-dinner drinks next to a roaring fire in wintertime or in the yellowwood- panelled pub, 'The Ruthland Arms'. Your Hosts, Clive and Mark, provide Cape hospitality at its personal best and will assist in your selection of a fine wine.